Whether you’re in college or looking for round-the-clock transport, the Razor Ecosmart Metro Electric Scooter with Seat will have you covered. Not bothered about the seat? Try the Razor E100 electric scooter. It’s a light, fun-packed ride that is meant to help teens and adults travel in a safe effective way, where they need to go. 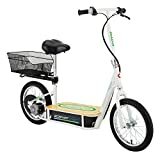 It’s battery power switched, has a bamboo deck, is equipped with adjustable handlebar rake and seat and has been fitted with a powerful 36 volt electric system supported by a 500w motor. With its 500w motor, 36 volt electric system, it would be a mistake to underestimate the power of the Razor Ecosmart Metro Electric Scooter. The high torque motor is located just underneath the deck and generally doesn’t in any way sabotage the driving and cruising. Since the motor is of only 500 watts, we’d rather recommend to take this Ecosmart metro scooter on a short trip or semi-long commutes instead of big trips. The Ecosmart metro scooter is ideal for rides around the neighborhood, shopping trips, going to see friends or just riding around town. If you are looking for an eco-friendly companion that will be able to transport you anywhere, whenever you like, the Ecosmart is a fantastic choice. If you decide to invest you can be sure that your commutes will become easier, more efficient and of course more enjoyable. It’s important to note that the Ecosmart Metro scooter doesn’t have a front braking system. It’s only equipped with a rear brake, however its alternative is just as effective. It’s important to pay attention when riding because of this, since you may find it troublesome to break immediately if something jumps in your way. Shorter braking distances are definitely not a forte here, but the rear brake is just as responsive and can have you halt within seconds, providing the rider has good reflexes. The rear break is hand-operated and can be used by the rider whenever needed. This allows for great control over when you need to stop. Luckily, the brake is also located on the adjustable handlebar rake and seat for ultimate convenience. All you need to do is squeeze the right adjustable handlebar rake and you will halt within seconds. The Razor EcoSmart Metro has big, air-filled 16-inch pneumatic tube tires with reliable, tube tires on spoke wheels. The size is comfortable and ideal for every-day rides. They don’t speed too fast, don’t get caught up on small disturbances on the road, and can handle various terrains with dignity. However, due to the lack of suspension, you may experience quite a few rough rides depending on just how rough the terrain you are on is. The tires can be compared to standard bicycle tires used on the market. The Ecosmart metro scooter can be classified as a perfect transportation device for around-the-city trips. In essence, the ideal city-cruiser for any scooter enthusiast, or for anyone looking for a faster, quicker way of commuting. You may also be interested in reading our review of the EcoReco M5 commuter scooter before you make any buying decisions. Thanks to the spoke wheel design, you will be able to replace the wheels quickly and without a fuss. Should you run into obstacles that puncture them, or just want to be safer and exchange the tires after years of riding, the process will be easy and painless. We can easily classify the Razor Ecosmart as being quiet and powerful. Two very important factors that are vital when riding around and maneuvering around crowds. This is mostly thanks to the high-torque, chain-driven motor and then smooth, 16-inch pneumatic tube tires wheels that cruise flawlessly. You will be able to reach a top speed of 10-15 miles per hour within minutes. Getting where you need to go won’t be a problem anymore. The maximum speed of the Razor Ecosmart can result to about 20 miles per hour, depending on the weight of the rider and the state of the terrain that they are cruising on. Downward slopes will naturally initiate quicker acceleration times, which is why we recommend using a helmet for safety precautions. Overall the speed of the Razor Ecosmart Metro Electric Scooter is a by-product of the fact the the Ecosmart metro Razor scooter in general is very nimble and doesn’t weigh too much. You can speed by on sidewalks quickly, and this is quite impressive for such an affordable scooter. The natural run-time of the Razor Ecosmart equals to about 40 minutes, and on some occasions, 1 hour. This all depends on the weight of the rider, the incline of the roads they are riding on the the terrain surface in general. The li-ion battery is placed right underneath the strong bamboo deck, which can sometimes be a problem depending on what kinds of roads you are planning to cruise on. It can easily get caught up around curbs, or when swerving around more rocky areas. However, this design also ensure quick rides, and a light-weight, quick performance whenever you are outside. Should the battery die before you arrive home, you can always kick-push the Ecosmart metro scooter yourself as a kick scooter. This efficiency is definitely something famous to Razor. The charging times of the Ecosmart metro scooter usually range from 6.5-8.0 hrs. It is, however, important to note that sometimes the battery charge for the metro scooter needs to be purchase separately. That’s why we encourage potential buyers to consider the cost of both of these purchases before investing, and to carefully read if the charge is included within the bundle they are purchasing. Not polluting the planet is about as good as it gets, especially if you can do so while enjoying the engaging features of the Razor Ecosmart Metro. With no gasoline needed, the Ecosmart metro scooter can be seen as an all-around, eco-friendly companion. Together with its powder coated frame, cozy padded seat and hand-operated brakes, a ride on the Razor Ecosmart Metro Electric Scooter is not only fast and efficient, but comfortable, too. The detachable luggage rack and basket that are attached on the back can be easily removed when needed. They are, however, great storage spaces for quick shopping bags, coats or other miscellaneous accessories that are a bother to drag around when riding, like backpacks and school books. The Ecosmart metro scooter also has a kick stand so that you can temporarily park anywhere you need to. Whether it’s for a quick shopping escapade or for a longer rest at the local park. The Ecosmart weighs about 67 lbs, which is extremely light-weight for a scooter of its kind. Its assembled dimensions equal to 59.5″ x 20.25″ x 41.5″, and the maximum weight of the rider than can use the Eco is about 220lbs. The Razor Ecosmart Electric Scooter is the ideal seated electric scooter for commutes for everyone and anyone needing a new way of transport. A scooter for teens going to college, or for adults trying to get to work, or for anyone that wants to cruise around the neighborhood and/or towns for errands. The Ecosmart metro seated electric scooter can be used by anyone that is over 16 years of age, and in some cases, even younger mature teens. If you need a budget and affordable device to help you get around, the Ecosmart was design to accommodate just that and more. It cruises quickly, quietly and efficiently and can get you from point A to point B with stunning reliability each time. Why We Like It – We’ve become attached to the Razor Ecosmart Metro for quite a few various reasons. It has a very cozy ultra padded seat the makes riding comfortable, it doesn’t make much noise, if any at all, it’s light-weight, highly affordable for anyone looking for new transport, it has a lithiuim-ion battery and isn’t powered by gasoline which saves the worry of pollution, and it can carry up any rider weighing up to 220lbs. All in all, the EcoSmart is a well-rounded Razor scooter that has all the vital features one could ask for. Including a rack and basket for personal belongings! If you are also interested in other options, we can fully recommend the Ubesrcoot from Evo. It can be ridden even by kids as young as 12 years old, and is perfect for all-around fun around the cul-de-sac. It features 10” pneumatic wheels, has 1000 watt batteries, and a relatively quick charging time that ranges between 4-8 hrs per charge. The UberScoot 1000w scooter with seat is also foldable, and has a battery life of around 250 cycles, which means you can ride your scooter for quite a long time before you need to go out of your way to purchase a new one. The maximum speed of the Uberscoot ranges from 24-26mph and it does great on bumpy and rough roads. Read more about electric transport and commuting in this study by a Stamford student.